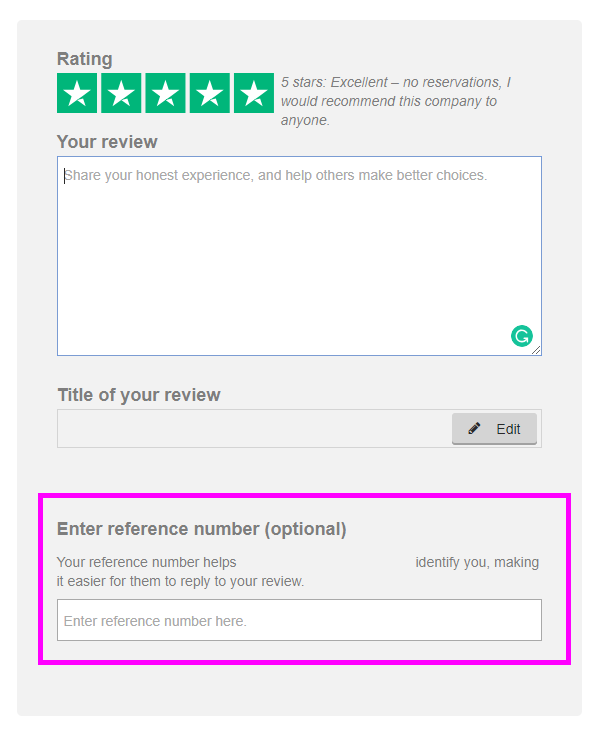 Companies can request reference numbers from reviewers using Trustpilot's reference number function. Sometimes, it's difficult to recognize a service experience from reading a review. You've got a user name and a review, but more information would help you respond to a review. That's why you can ask reviewers to provide a reference number when they post a review. Reviewers aren't required to provide a reference number to write a review, it's in everyone's best interest to quickly identify a service experience. Reference numbers confirm that reviewers are leaving reviews about genuine experiences, and companies can more easily identify and respond to reviews that have a reference number. Log in to your Business account. Select Service Reviews, then select the Set up ref number tab. Select the Yes, please ask for a reference number radio button, and in the text field, enter what you want to call the reference number (for example, order ID or booking number). Now when your customers review your company, they'll be asked to provide a reference number. But please remember, this information is optional. A customer can still post a review without providing this information. Note: Trustpilot cannot validate reference numbers.